A project is a governed space in Senate where you can manage your data exchange. Within a project, you can collaborate with others, request access to data sources you intend to use, outline your intensions to the data owners, discuss pricing and license data for permitted use. To access and analyze approved datasets in a project, Discovery Workspaces (quarantined virtual machines) can be requested. Projects have different goals and outcomes, create a new project as needed for each exchange you complete. 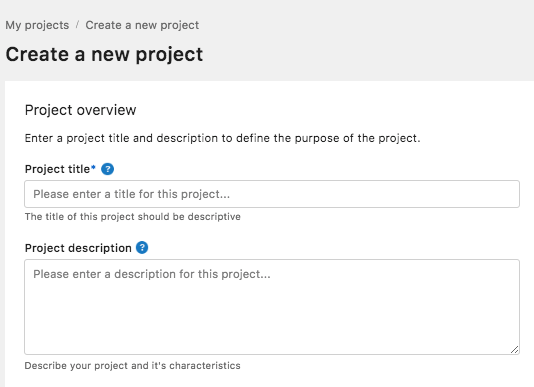 To get started, click Projects from the left navigation menu, then click the 'Create a new project' button. Give your project a title; something that will help you and your collaborators identify this project if you have more than one. From here, you can find a dataset from the Catalog to add to your project, or invite new project members.